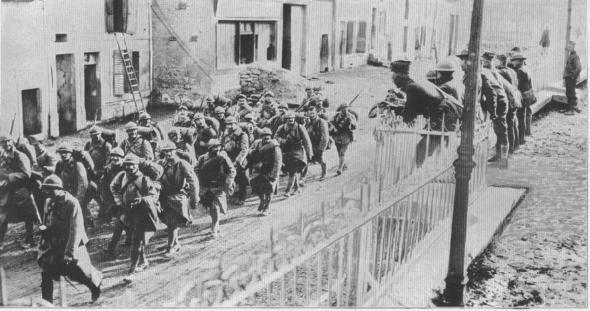 "FIFTY MILLION FRENCHMEN CAN'T BE WRONG"Here we see a group of American soldiers, members of the 95th Company, Marines, 2nd Division, at Sommedieue, France, greeting their French brothers-in-arms as the latter march toward the fighting lines, April 29, 1918. THE ARTILLERY GOES INTO ACTION AT DAWNBattery F, 7th Field Artillery, 1st Div., in action. 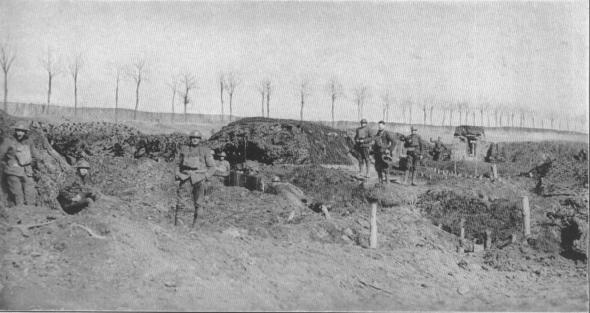 The photograph shows the camouflaged gun pits and dugouts, between Beaumont and Rambucourt, France. The trees in the backgound have been denuded of all their beauty.